Cannabinoids all start off as Cannabigerol, or CBG. CBG’s precursor, cannabigerolic acid, or (CBGa) is the primary cannabinoid. It is non-psychoactive and can be thought of as the “stem cell” of other cannabinoids found in cannabis. It is the precursor to the three major branches of cannabinoids: tetrahydrocannabinolic acid (THCa), cannabidiolic acid (CBDa), and cannabichromenic acid (CBCa). The plant has natural enzymes, called synthase, that break the CBGa down and mould it toward the desired branch. 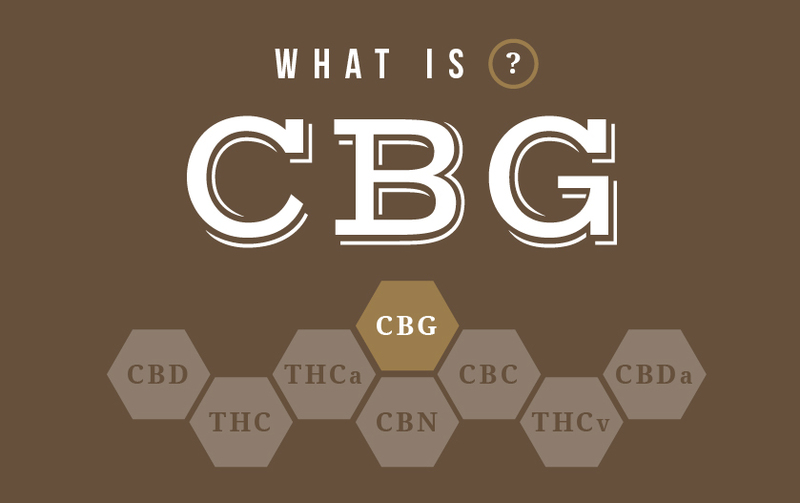 When exposed to heat, or prolonged UV light, CBGa will break down and become CBG. This break down explains the low concentration of CBG in most strains. Besides its role in forming other cannabinoids, CBG has a number of important effects of its own. In January 2015, researchers studying CBG in mice discovered neuroprotective effects with Huntington’s disease and have shown promising results in slowing down colon cancer. CBG cannabis strains will hopefully be used therapeutically as an antidepressant, and as a functioning painkiller. CBG’s antibacterial effects can alter the overall affects of cannabis. CBG is known to kill or slow bacterial growth, reduce inflammation, (particularly in its acidic CBGa form,) inhibit cell growth in tumour/cancer cells, and promote bone growth. It acts as a low-affinity antagonist (a type of receptor that blocks or dampens agonist-mediated responses rather than provoking a biological response itself upon binding to a receptor) at the CB1 receptor. CBG has also been found to inhibit the uptake of GABA, this causes a feeling of relaxation. Researchers suggest that CBG cannabis strains will also be beneficial for the treatment of psoriasis, glaucoma, multiple sclerosis and skin diseases. Where Can I Find CBG? All cannabis contains CBG as it is a minor cannabinoid found during the early stages of the cannabis growing cycle and extracted from budding plants during their flowering stage. This makes it difficult to obtain in large quantities. Industrial hemp was recently discovered as a producer of higher levels of CBG than most cannabis strains. At FARM all forms of phoenix tears will have CBG, more specifically, the Viridesco Phoenix Tears, and the Medibloom: Lyme Aid Phoenix Tears contain a tested CBG amounts. Speak to any one of FARM’s knowledgable budtenders for dosing information, and other CBG alternatives.